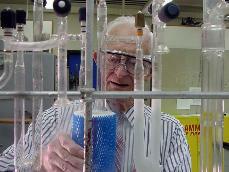 ·	University of PennsylvaniaChemistry professor Alan MacDiarmid, shown working in a lab, died yesterday afternoon. A Nobel Prize winner, he was internationally acclaimed for his research in inorganic chemistry. Chemistry professor Alan MacDiarmid, one of three recipients of the 2000 Nobel Prize in Chemistry, died yesterday afternoon. He was 79. MacDiarmid had been suffering from Myelodysplastic Syndrome, a disease that affects the bone marrow and blood, for the past four years. He passed away due to complications relating to the disease after he fell down the stairs of his home in Drexel Hill, a suburb of Philadelphia. He was rushed to Delaware County Memorial Hospital, where he was pronounced dead at about noon. Born in Masterton, New Zealand, MacDiarmid is survived by his wife, Gayl, and his four children from an earlier marriage, Heather, Dawn, Duncan and Gail. MacDiarmid came to the University in 1955 and taught undergraduate and graduate courses specializing in inorganic chemistry until he won the Nobel Prize for his discovery that plastics can be made to conduct electricity. After receiving the prize, he devoted the majority of his time to his research projects, including a U.S. governtment-sponsored effort in which he tried to find ways to move from a fossil fuel-based economy to one that relies on hydrogen. . Please share your memories of Alan.